Market timing is discredited by passive investment advisors as a voodoo ritual. Buy-and-hold proponents argue most compellingly by citing the “missing out” scenario - they show a dramatic drop in return, to Treasury Bill levels, if investors are out of the markets for only a few good days. Missing these market surges is considered a risk of lost opportunity. However, they conveniently ignore the risk of being hit by devastating market crashes and the associated emotional stress of staying in the market at all times. I quantify this anxiety level by calculating the historical stock market drawdown for the past 137 years, since Ulysses Grant was President. You decide if staying the course justifies the pain and suffering. If you could avoid the nastiest crashes at the expense of missing a few spectacular rallies, how would your return fare against that of buying-and-holding? Most of the “missing out” calculations show missing only the best days. Those analyses cover only a decade or two. I examined monthly data as far back as 1871 and daily data from1942 to present. I used the S&P500 total return index with dividend reinvestment. I considered three scenarios, namely, excluding the best surges, removing the worst plunges, and eliminating both the best and the worst extremes. To compare those three scenarios to the buy-and-hold benchmark, I calculated their CAGR (Compound Annual Growth Rate), sometimes referred to as the geometric average annual return. Figure 1 shows the CAGRs for the different “missing out” scenarios based on monthly data. Excluding the best twenty-four months would reduce the return from 8.6 percent (the buy-and-hold benchmark) to 6.4 percent. What most passive managers don’t report is that by avoiding the worst twenty-four months, you could boost return to 11.5 percent. Figure 2 presents CAGRs based on daily data. Excluding the best fifty days lowers the return from 10.0 percent (the buy-and-hold benchmark) to 6.1 percent; but eliminating the worst fifty days increases performance to a remarkable 15.2 percent. 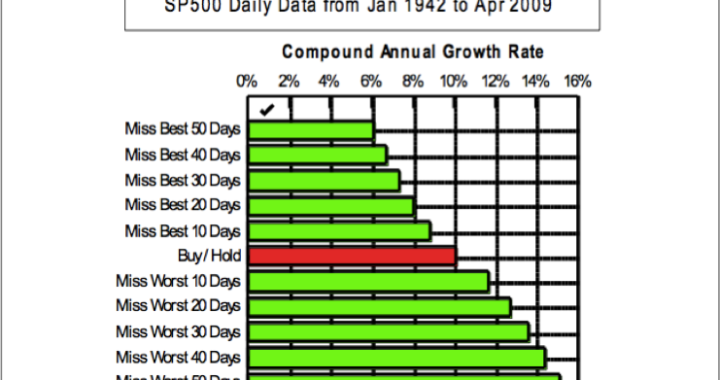 The returns of missing both the best and the worst months are better than the returns from the buy-and-hold strategy as shown in Figure 3. Missing both extremes beats buy- and-hold across the board as shown in Figure 4. Who would mind getting similar returns to buy-and-hold without the volatile extremes? Isn’t volatility considered risk? The seemingly compelling “missing out” argument cited by buy-and-hold advocates falls apart under cross-examination. Passive investment advisors commonly advise their clients that the longer investments are held, the greater the chance for attaining positive returns. The upward bias of the stock market favors buy-and-holders. To determine the breakeven holding period, I calculated the equity drawdown of the S&P500 index. Drawdown is the percentage decline from the most recent equity peak. It represents the emotional pain investors have to endure while holding stocks of lost values. 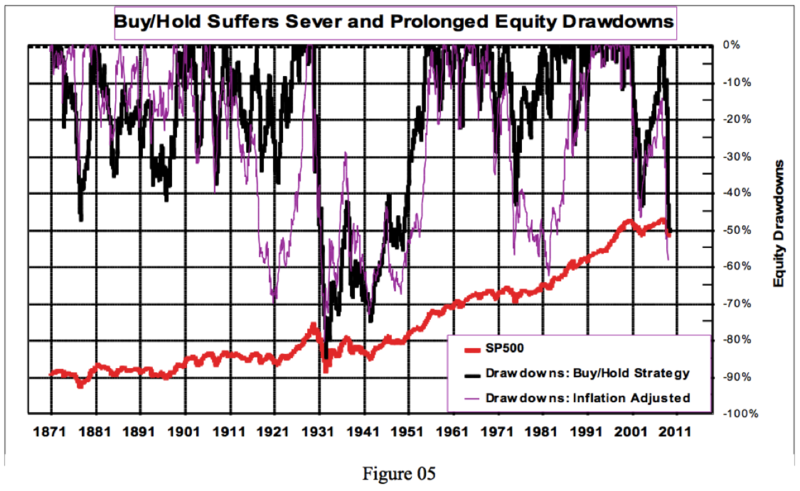 The black curve in Figure 5 illustrates how often, how long, and how severe the S&P500 index suffers from drawdown, measured over the last 137 years. Let us examine the plot closely. First, drawdowns occur more often than one might think. Equity is underwater ninety-two percent of the time during this period. The roaring1990s is the exception rather than the rule. Drawdown consumes over fifty percent of this most bullish decade. Second, many drawdowns last a long time. The 1929 crash took twenty- six years before it finally broke even in 1955. Third, since equity investments are considered an inflation hedge, we must consider inflation when discussing drawdown. The purple curve shown in Figure 5 is the drawdown adjusted for inflation, as measured by the Consumer Price Index. Although the nominal S&P500 index made new highs briefly in 2007, the real S&P500 was fifteen percent below its 2000 peak at the time. Inflation adjusted drawdowns are steeper and longer than nominal drawdowns. Drawdowns with devastating magnitudes are quite common. The market suffers losses in excess of forty percent more than a third of the time. Only a man of steel can withstand the frequent, prolonged, and torturous emotional trauma inflicted by staying fully invested at all times. “No one purchases just one index. We diversify...” argue buy-and-hold enthusiasts. By constructing a portfolio of uncorrelated stocks, you can dampen the impact of the specific risk of each stock. But correlations among different asset classes change with time, depending on the market environment. Two previously uncorrelated stocks can suddenly move in unison and render diversification ineffective. More importantly, diversification cannot dodge the systematic risk of the entire market. During bear markets, most stocks decline together. When systematic risk is exacerbated by the systemic risk associated with the catastrophic collapse of global financial institutions, not only do the equity markets take a blood bath, but most other assets follow. In 2008, all asset classes plummeted, including US equities (all styles, sizes, and sectors), emerging markets, bonds, real estates, commodities, and currencies. The only uncorrelated asset during a systemic crisis is cash. The prudent way to reduce risk is to rebalance your portfolio with cash equivalents. Isn’t that called market timing? Buy-and-hold proponents may cling to the belief that market timing is futile, since no one knows the future. Who said that market timers must foretell the future? Active asset allocation practitioners like Brian Schreiner and Mebane Faber are trend followers. As mentioned in their recent articles, a ten-month moving average system would have avoided both the 2000 crash and the 2008 meltdown. Is the moving average system a sound investment methodology or just a myth? I will explore this topic in a future article. All data are total return series. S&P500 Monthly Series – Provided by Robert Shiller of Yale University. S&P500 Daily Series – Provided by Ultra Financial Systems, LLC. UPDATE: Read the original replies to this article.